From amateur cheese reviews to the nature of existence. For this review I return to an old friend, though for my international readers this cheese may not be quite so familiar. I introduce you now to the cheddar that isn’t cheddar, colby cheese. Colby was invented in Colby, Wisconsin in 1874 by Joseph F. Steinwand. 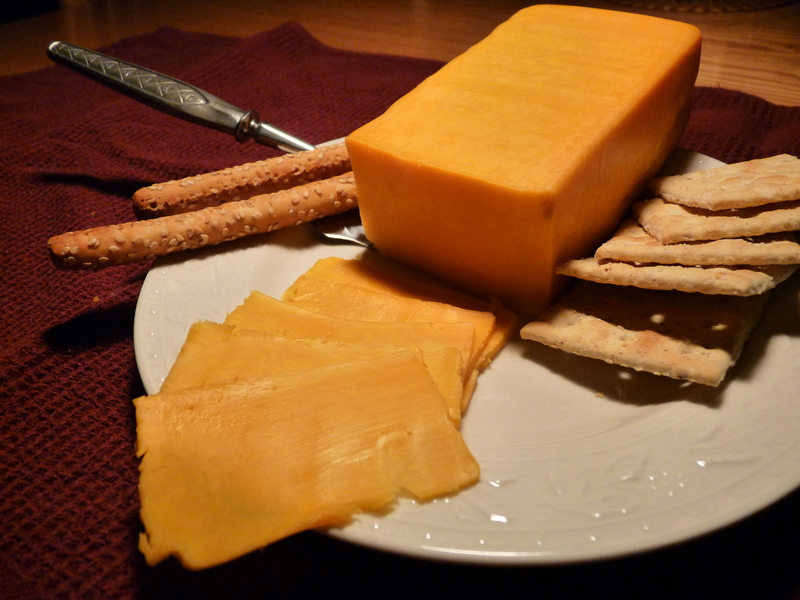 It is very similar to cheddar but does not undergo the “cheddaring” process and is not aged. Since colby is a distinctly American product I don’t know how much of it is sold internationally, so perhaps not everyone reading this has already tasted it. I purchased a longhorn cut of Boar’s Head brand colby cheese to taste for this article. When I first taste a cheese, I always like to taste it in isolation, with no other flavors, so I started by slicing off a piece and savoring it. I was struck by the flavor similarity to cheddar, although colby is not as dry and tough as some ancient cheddars I’ve tasted. Before you send me hate mail, I’m not bad-mouthing cheddar, it’s one of my favorite cheeses. I have had some cheddar, though, that is so strong and so thick (like peanut butter) that I only need a slice or two to feel sated; that and it gums up my mouth and requires a lot of fluids to consume. Not so with colby: colby is a young cheese, moist and soft. I was less impressed once I tried the colby with crackers, however. The cheese is quite mild and its flavor is easy to overpower. I’ve found that with age (old man here at 30), my tastes have “matured” which is another way of saying my taste buds are getting dull or dying off. I enjoy eating colby straight off the block, but the flavor is a bit too mild to pair with anything strong. If you’re looking for a finger-food cheese then colby is a delicious choice that won’t clog your mouth too quickly, and I bet it would make a mean grilled cheese sandwich. However, if you’re looking for something strong to pair with steak I’d look elsewhere. Ultimately, colby is much like the nation of America itself: young and tasty. It won’t impress your hipster friends, it doesn’t go over well at high-class parties, and it loses some of its flavor when held up against other things, but that doesn’t mean it isn’t worth your time. Carve a hunk right off the block and savor the idea that a cheese can be a perfect snack unto itself.